B side—Sometimes referred to as the “flip side” during the era of the 7” vinyl, 45 rpm single, meaningful only in contrast to the A side, which contained the more heavily promoted song, presumably the “hit.” The alternate (non-hit) song on the B side could well become a hit, of course, revealing the slipperiness of the A/B distinction. In contemporary marketing terminology, the B side could be considered the equivalent of “value-added content,” but in the era of the compact disc the B side has largely been supplanted by value-added content referred to as the “exclusive” or “unreleased” track, the “bonus” track, the “non-album” track, or “rare” track (which may once have been a B side if the group has been recording long enough). The “outtake,” which once referred to a performance of a song left off a release, is now sometimes disingenuously referred to as an “alternate” version, and is considered as an additional, exploitable revenue stream by the “content provider” of the artist’s music. 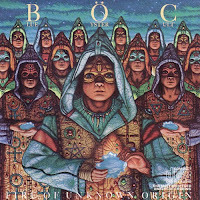 In its song about the hellish, self-destructive life of the rock star, “Burnin’ For You,” Blue Oyster Cult’s vocalist laments all the time he’s sacrificed to his life on the road, speaking of “Time I’ll never know,” and realizing “Time ain’t on my side.” He also wryly observes that unlike his fans, he has no time “to play B sides” (the mondegreen version of this line widely available on the web renders it, “Time to play besides”). For the music consumer, the collectable value of the B side exceeds its potential aesthetic value. Just as the automobile exceeds its strictly utilitarian value as a means of transportation and possesses a symbolic cultural capital (“status”), so to does the B side to music collectors. To possess all of a band’s released singles means that one also possesses all of the B sides. The B side gives the collector a sense of completion, of plenitude, but it also exemplifies a world of chronic overchoice and oppressive abundance. To lack all of the B sides, though, is to render one’s life incomplete and unfulfilled, and contributes to the development of obsessive behavior and excessive monetary expenditure.